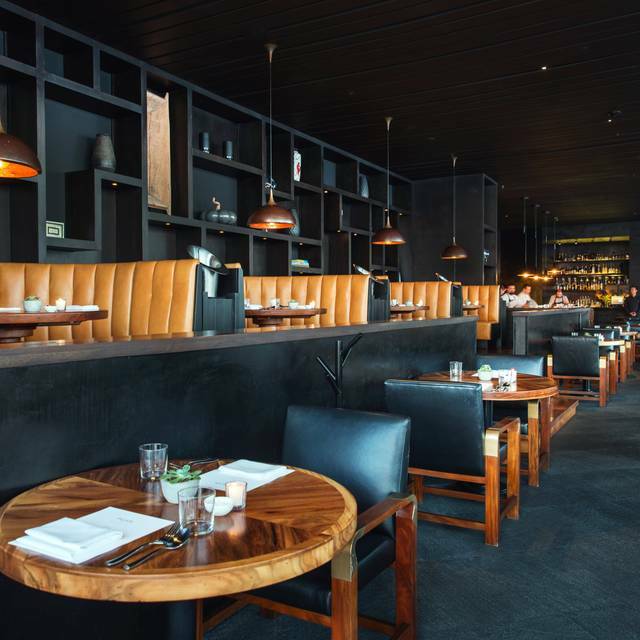 By Renowned Mexican Chef, Enrique Olvera, Manta is the culinary centerpiece of The Cape, A Thompson Hotel. With an intriguing double meaning, the manta ray symbolizes the kitchen"s focus on seafood, while manta, the Spanish word for blanket, conveys the chef's emphasis on comfort. 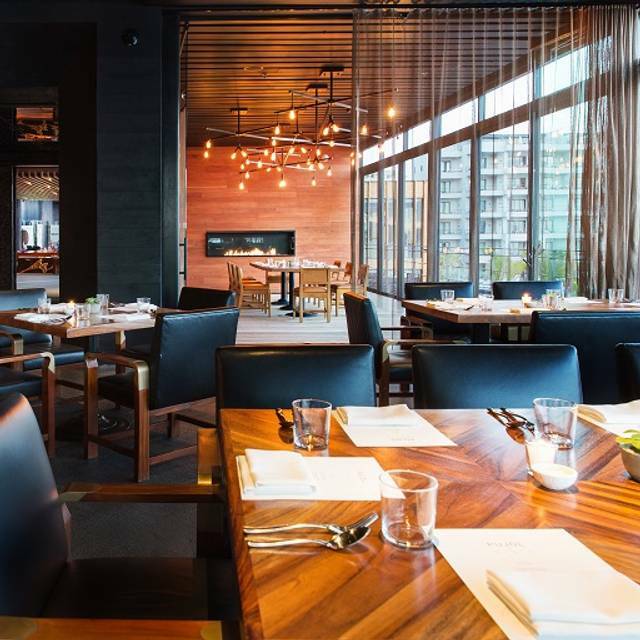 Acknowledge by the New York Times for his "way of confirming and subverting expectations of Mexican food at the same time," Olvera has drawn inspiration from the izakaya tradition to introduce a pan-Pacific concept of Mexican cuisine. 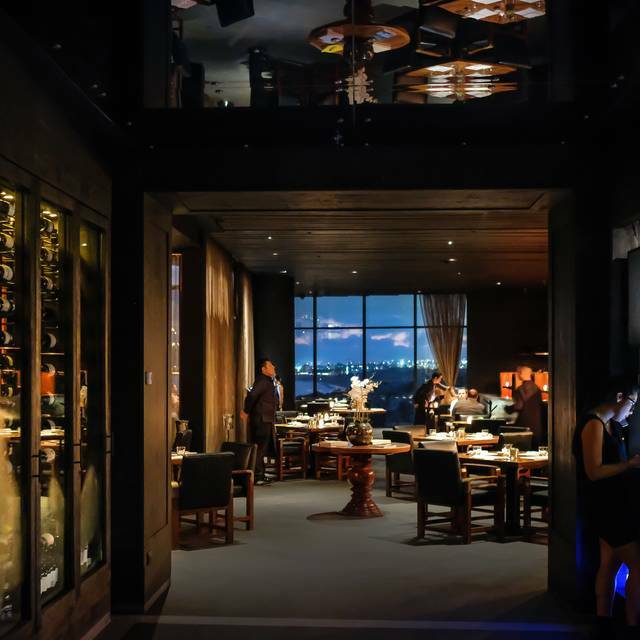 The intimate, richly textured space features a dramatic exhibition kitchen and a curated beverage menu focused on mezcals, tequilas and sakes. Some of the best food I’ve had in a long time. The service and ambiance was great as well. Loved the atmosphere, And drinks. the building was absolutely beautiful but the food was VERY small portions for the price. The food was pretty good but just not worth the price. Not sure if I’d come back. Fernanda and leonel provided phenomenal service, the view and food were unbeatable. Our waiter was extremely slow and not professional. Talked over us and did what he wanted to do regarding our service. We went to Manta while on vacation in Cabo for the week. 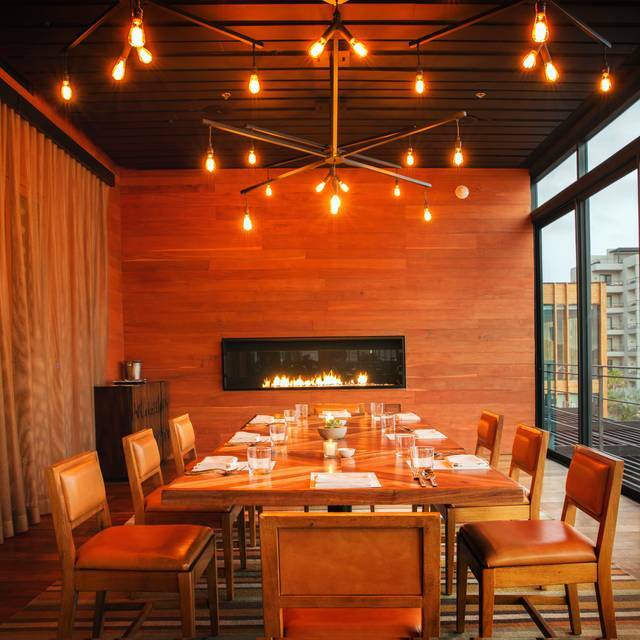 I have celiac and the restaurant was super accommodating, and our server was very knowledgeable about the dishes that were already naturally GF or could be prepared without gluten, which was wonderful. We each got the 5 course tasting menu and had different dishes. The most memorable were the tuna sashimi, “vuelve a la vida” ceviche (only photo I managed to take), catch of the day, pulled pork bao bun, and the best rice I’ve ever had. We’ll be thinking about the next time we can come back, and will be going to Cosme and Atla in New York in the meantime. Food and service was amazing. View is incredible. We were seated at a table and the light was really bright where I was seated. We asked to be moved and they moved us to a booth and were very kind about it. Our waiter was amazing, just like the food. Thank you Manta. This was our second time visiting this restaurant. Crowd was light when we arrived but did fill up around the 8pm hour. We again ordered the tasting menu. Because there were two of us, we ordered eight different items and shared them. It was a perfect amount of food. Highlights for us was the watermelon salad, the lobster, chicken and the beef. I loved their version of tres leches as well. The only issue we had was in understanding our waiter. It wasn't the language barrier but rather how quickly he spoke. We gave up asking questions because it made us feel like we were bothering him and did diminish the "food" experience for us. We still highly recommend and think it was just this particular server. Was a great atmosphere and the food was definitely interesting but really tasty! Definitely worth visiting when you are in Cabo. In Baja, I prefer to dine at traditional Mexican restaurants, so to that end, it was my error to choose this place for dinner. This place could’ve been in L.A. or Miami or Toronto. It was a classic “see and be seen” nouveau rich type hangout that isn’t my favorite. We were sat at 640pm and it turned into a three hour marathon of a dinner with creative dishes however, lacking the flavor one would expect from the ambience and the price. I am not afraid to spend, however would prefer to overpay for supreme quality and service, neither of which hit a homer for us on this particular evening. Great food, beautiful place and the service excellent, Manuel and Leonardo are great waitresses. Sat outdoors on patio - awesome vista. Best meal of the year, inventive and exquisitely prepared and served. The portions were small but perfect. The way the menu was laid out was a little confusing but in general we loved it. The best part of the experience was the initial rice crisp with avocado purée — I would go back just for that which! Unfortunately the other dishes were okay (we tried the tuna, ny strip, and fried chicken) and nothing too spectacular compared to Enrique Olvera’s other restaurants we’ve eaten at. The service on the other hand was super attentive and accommodating to a gluten allergy! A few years ago, Enrique Olvera made quite an impression on us in San Miguel de Allende. In fact we found his restaurant to be so good, we had dinner there twice during our weeklong stay. 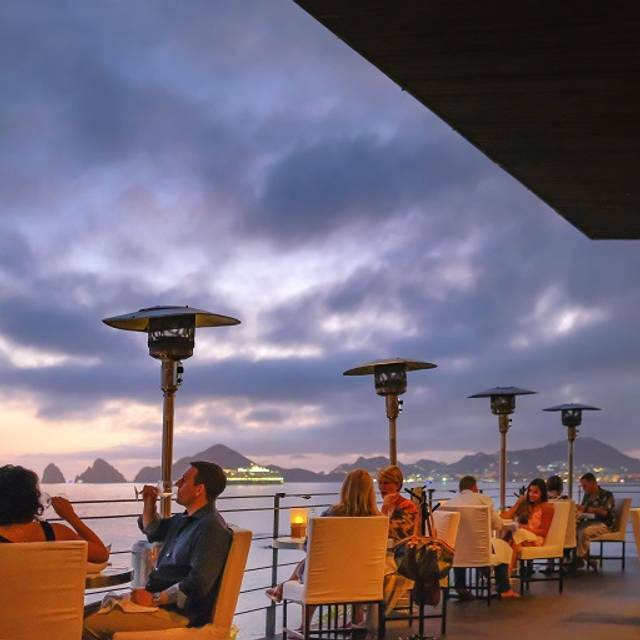 Expecting the same high caliber food, we went all in with the chef's tasting plus wine pairing at Manta in Cabo San Lucas. Unfortunately it was quite a different experience. Many of the eight dishes we selected underwhelmed. Although both of us had different dishes for each course, we both had the same wine to go with each course. The incredibly tender octopus in the octopus anticucho was a standout. Get there early and go to the rooftop bar for a great vantage point to see the arch and sunset. Be prepared to spend some serious cash. By the time we left these two spots, it was $425 for two people. Definitely the most expensive place we visited during our stay in San Jose del Cabo. Lovely venue, amazing views, superb service. The drinks were excellent, some of the courses were very good, others somewhat average. 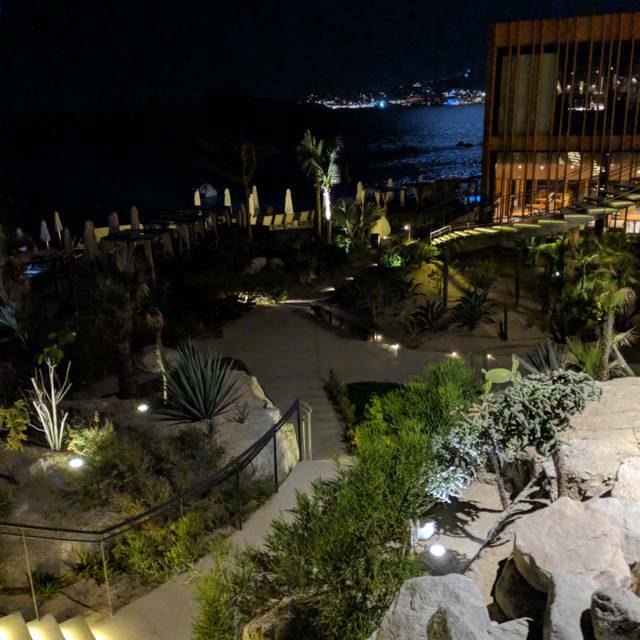 I would go again for drinks and to enjoy the view, there was nothing wrong with the food but for the price I have had better and more innovative. Everything was beyond incredible. 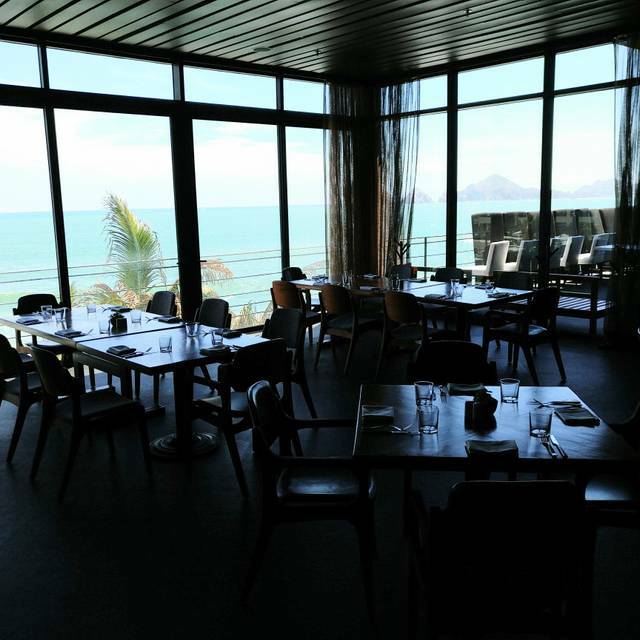 Food, ambience, view, service. It was beyond impeccable and would come back here in a heartbeat!!!!! Enjoyed everything about this restaurant the drinks, the food, the location and the service. We enjoyed it so much we came back again. Lots of great fish options but some interesting meat options including Wagyu beef and New York Strip. Liked the idea of trying a select your own five course tasting menu or ordering slightly larger dishes straight from the menu. Top of my list were the scallops, which may sound bland, but not the way they were presented here - a whole orchestra of tastes. I liked the combination of espresso and orange in my cocktail as well - sounds weird but worked well. Manta is fantastic! The fusion of Mexican and Japanese cuisine was delicious and creative. The 5 dish tasting menu option was very satisfying and in my opinion, the best way to make the most of the experience. The staff at Manta, specifically Adriel and Rodolfo, were very attentive and assisted us in navigating the menu and superb wine list. Overall great food, service and ambiance. I will come back every time I’m back in Cabo. Ok, Manta. You were incredible. This is the kind of experience I dream of on a vacation. All five senses are delighted and all details thought through at Manta. Furnishings, blankets to keep you warm outside, the hand soap, the delightfully textures stoneware, and of COURSE the courses of food coasting through my happy veins now. I love fusion food and this place reinforces why that is the case. Even the humble sweet potato is given the royal treatment of a (I think) miso glaze to beset the distinct and rich mole. One example of courses on a menu that is diverse but everything executed with love of simplicity, perfection and with a small delightful twist. If I could wear food on the outside, Manta would be my favorite black jumpsuit—a chic, cosmopolitan, yet accessible standby that makes me feel great. Thank you, chef and staff. Thank you, Ambrosia for writing about this place so I could find it and tell everyone going to Cabo San Lucas about it. We wanted to love the restaurant- setting is beautiful. The food was ridiculously overpriced and not tasty. $50 for 2 street style lobster tacos. $50 for 4 paper thin skewers of wagyu that they want guests to grill and then to make into a taco. Bill was $300 and we were so disappointed. Save your money and just get a drink at the rooftop bar. Michael and Manuel were our servers. they were amazing! All their food and cocktail recommendations hit the spot! Crab tacos - off the menu item - were amazing! So were the Suckling pig buns and the tuna sushimi. They gave us a free birthday dessert and provided ponchos when we were cold. Highly recommend to everyone! Beautiful setting and excellent service. Decent wine list but very small “by the glass” selection and none reasonably priced which put a damper on our overall experience. My soup was truly delicious and fish selection was good but there is only so much one can do with fish. My husband ordered the $90 tasting plate (pick several items, smaller portions). While nice to try various foods, it was definitely over priced. Probably won’t go back unless they change things a bit. Dear Dixie2006 Thank you for your recent review. We are glad that you enjoyed your experience with us. We look forward to welcoming you back on your next trip and many more occasions to come. Sincerely. Manta was magical! Better than 5 stars with each of the categories – Food, Service, Ambience. Wonderful food, excellent service, and a sunset view of El Arco from Monument Beach with surfers below. I expect this to become the most memorable restaurant dining of the past few years and we dine out 50-60 times a year. My wife hesitated before telling the maître d we would sit outside. Twenty minutes later he let us know we could move inside if we were uncomfortable (we weren’t). Such sincere and considerate service continued throughout our 2 ½ hour stay. 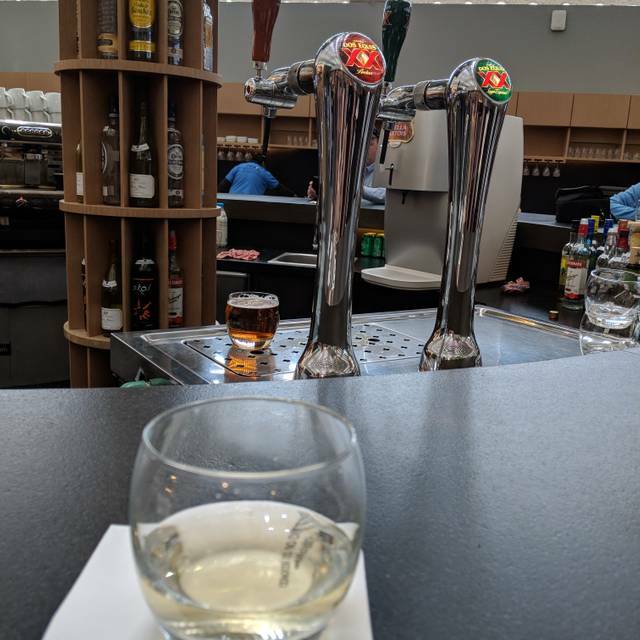 As to Value, we were charged $244, including my $37 glass of wine, the 16% VAT and 15% Service charge, to which we added more tip for friendly informative service from the team of Luis & Francisco. This is maybe double what we average for a couple’s night out, but a bargain for the experience. We followed Luis & Francisco’s recommendations and the one less-than-knockout was the chicken, unrecommended but chosen by my wife. She had that a la carte along with the watermelon salad, which she enjoyed. I had the $90 5-course tasting, which allowed a wide selection. I opted for sashimi, octopus (tender & best ever), sweet potato w mole, lobster and tres leche. Each was exquisite. Food preparation and presentation locally in Chicago and throughout the US continues to improve in quality. 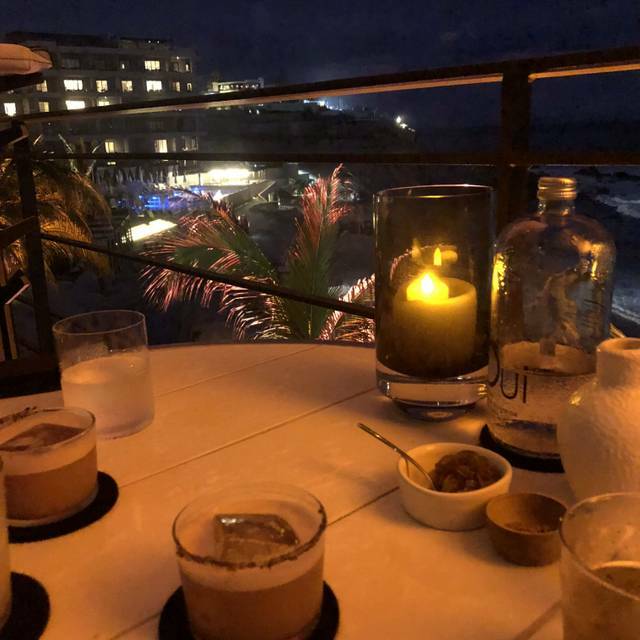 We had fine memorable (& more expensive) meals at a 2-star Michelin restaurant in Chicago last month, but this evening in Mexico’s Manta stands supreme. The service was good, the restaurant decor is beautiful but the food was incredibly overpriced and terrible, fish tacos were really bland, pork buns were dry and had no sauce or anything going for them. Overall very dissatisfied with our meal and paid a ridiculous amount!!! We come here every year. Love the food, ambiance and staff. Kudos to Gabriel the Wine Director. One of the best lists in Cabo. Standouts this time. Roasted sweet potato. Gringo lobster taco. Suckling pig. Sashimi. Scallops. NY steak with padrone peppers. Dessert were great too. Fried banana and thres leche cake. A special night dinning as it isn’t cheap😀. Food was good but timing was off. Took us 3 plus hours to have dinner. Manuel and Rodolfo were amazing. Their service contributed to our amazing experience. Their attention to detail, especially with my allergy was greatly appreciated. The atmosphere and the views were incredible...The service was amazing!! The food was excellent! Will definitely be going back next visit!